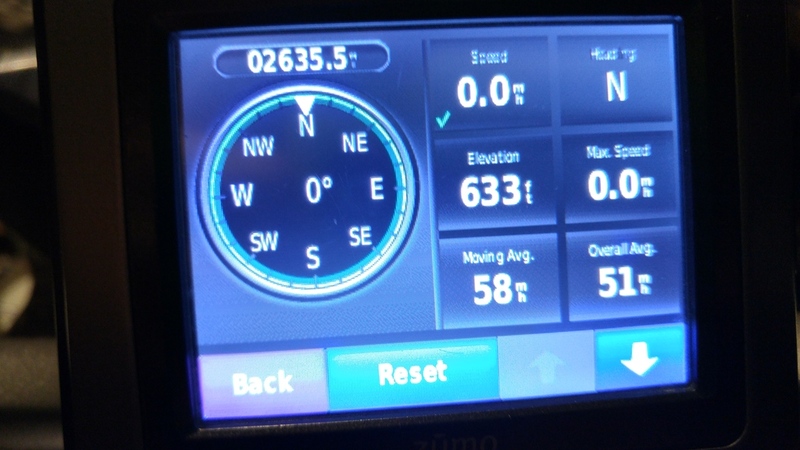 505.5 miles. Temps 50's to low 90's. I set the alarm for a 5am wakeup and early departure. I woke up at 4am on my own and decided that a short distance to the east it was already 5am so I'd go ahead and head out. I motored out onto a very quiet buisiness 40 and pointed east and hopped on 40 toward Amarillo. No stops today except splash and goes. Sunrise around Amarillo and I appreciated the black electrical tape I'd applied to my helmet visor the night before. Not much to say except a day of clicking off the miles. As I came into town on 114 I noticed a bunch of cones and stuff as I approached the speedway. Looks like today is the day for the Red Bull Air Races. I attended this last year and it was a lot of fun, but right now I just want to get home. A little bit of traffic, thankfully it's not a full on Nascar event or this would have taken a really long time to get through. Sadly, no planes making practice runs to keep me entertained. The police had 114 closed off to through traffic at 35 to keep the inflow of spectators moving smoothly so I ended up heading south on 35. I thought about looping back to get back on 114 but looking over at the traffic exiting the highway I decided to just go around. 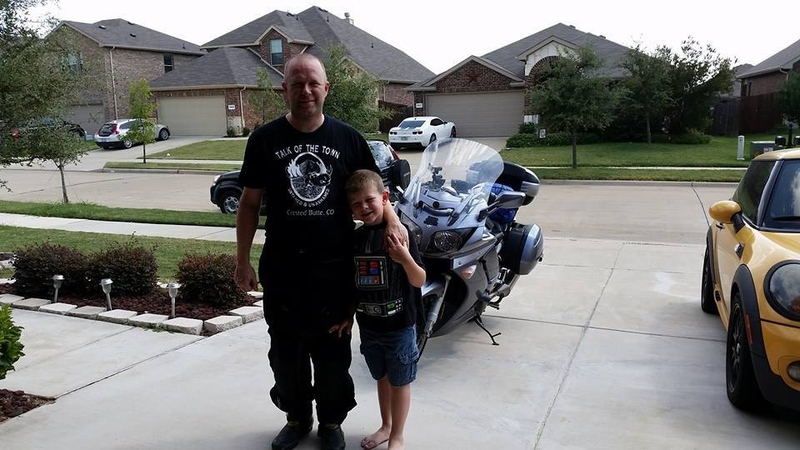 Another crazy city ride and soon I was on the other side of the Metroplex and rolling into the driveway just in time to sit down and have a late lunch with my kiddo who was happy to see his dad finally home after almost a week. Bike damage - $105.00 not counting scratches on side case. Lost items - $35.00 for RAM X-Mount and riser. Bugs collected - 5674 - No I didn't really count, but it looks like that. Items brought but never used. Cold weather gloves - my new gloves and the grip warmers were plenty. I packed these because I didn't know what kind of weather I'd be seeing at some of the higher elevations early in the morning. Tools and tire repair kit including pump. - I'm quite happy I didn't need these and obviously would bring them again. Extra SMH10 bluetooth device. Only exhausted the battery once on my primary and that was about 20 minutes from home so I didn't bother swapping. I didn't use my Ipod and SM10 too much but they were helpful in getting across Texas both directions so I'd include this again. Next time I think I'll just load me up my netbook instead of bringing my full blown laptop with me. The laptop is a heavy one and I only used it for brief checks online and to move photos and videos from SD cards to my portable hard drive. This could be accomplished with a smaller lighter device. I also didn't ever link up my SMH10 to my phone as most times I had little to no cell coverage and spent most of my time without data. Some last minute items I picked up that turned out to be useful. First was a $12 dry bag from Walmart. I'm failing to see how the much more expensive versions of this would be worth the money as this one seems of high quality and seals using the same system that surely won't leak. No problems with water in my stuff even after the heavy rainstorm on day 1. I also picked up some of the travel space saver bags. While they don't compress down quite like the ones you use with a vacuum, they do a pretty good job when you kneel on the bag to push the air out, which works when you are at a hotel and don't have a vacuum cleaner handy. I had two of these and packed my clothes in both of them. After day 1, clothes got moved around and one bag was for clean clothes and one for dirty clothes. On the last day, I divided up the remaining clothes and both were for dirty clothes. It worked well, but wasn't quite the space saver I'd hoped they'd be. I love my new Gerbings heated gear. I never turned them up much beyond the first click to turn them on and stayed warm the entire trip. The process of putting the jacket liner into the jacket is a huge pain and I ended up just putting the liner on me first and then the jacket on instead of installing it in the jacket. I never used the heated socks (were included in the deal when I bought the suit) but feel they'd have been nice if I were riding colder temperatures for longer times. This suit will be nice to keep me riding through our cooler months when temps dip down to the 20's and 30's. Not so pleased with my Rick Meyer seat. In full disclosure, this seat was not custom built for me and was purchased secondhand. That said, I'm not sure if my unhappiness would have been fixed on a custom build. The seam around the seat tried to saw my legs off it felt like. I had genuine saddle sores when I got home that took about a week to heal.